Located in The Lume development on Manchester's Oxford Road, this brand-new dual-brand property has officially opened and welcomes its first guests this week. Travellers to one of the UK's most vibrant cities can now take their pick from a brand-new Crowne Plaza or Staybridge Suites in the heart of the city. 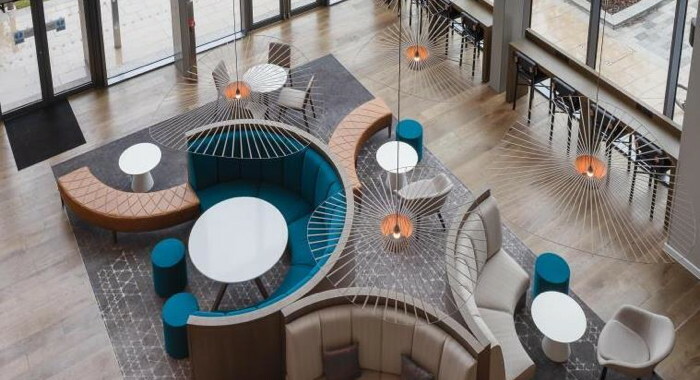 Occupying the lower 12-storeys, Crowne Plaza Manchester Oxford Road features 212 contemporary guest rooms, a fully equipped 24-hour gym, Crowne Plaza club lounge and seven state-of-the-art meeting rooms catering for over 200 delegates. The hotel's Laureate restaurant serves vibrant and fresh international cuisine and the Graduate Bar is a vibrant hub to meet, mix, eat and drink. On the top seven floors of the building, the vibrant new Staybridge Suites Manchester Oxford Road is a home away from home. Full of energy, as well as boasting quiet and relaxing zones including "The Den" with its cosy lounges, or the top floor terrace with panoramic views of Manchester city, this unique hotel is ideal for long stay guests. All 116 studios have exceptional views of the city, fully equipped kitchens, 24-hour gym access, laundry facilities and complimentary hot and cold buffet breakfast in the "Hub" kitchen. Andrew Fletcher, General Manager for both hotels, commented: "We couldn't be more pleased to have opened this stunning dual-brand hotel. For the first time, travellers to the north of England will have the choice of two different hotel styles in one central location. Giving both business and leisure travellers a new way to experience Manchester is something we have been excited about for some time. We have combined two hotels under one roof and are naturally delighted to now welcome people into what is a brilliant, relevant and flexible offer." The dual-branded hotel development forms part of the University of Manchester's Campus Masterplan, which includes the wider redevelopment of Alliance Manchester Business School. It also adjoins its new two-storey Executive Education Centre, which will provide a new home for the business school's corporate leadership and management programmes. Due to the hotels' easy access to transport links and Manchester's major tourism attractions and commercial hubs, short and long-stay business clients, leisure visitors, entrepreneurs, academics and those visiting the universities nearby, are all expected to become regular guests. The newly built 328-room hotel development is owned by M&L Hospitality and managed by Cycas Hospitality. If you are a member of IHG you may be interested in learning how to optimize your content on our network.